I absolutely love stir fry; and in my last CSA Food Share, I got most of the items I needed for a savory meal. 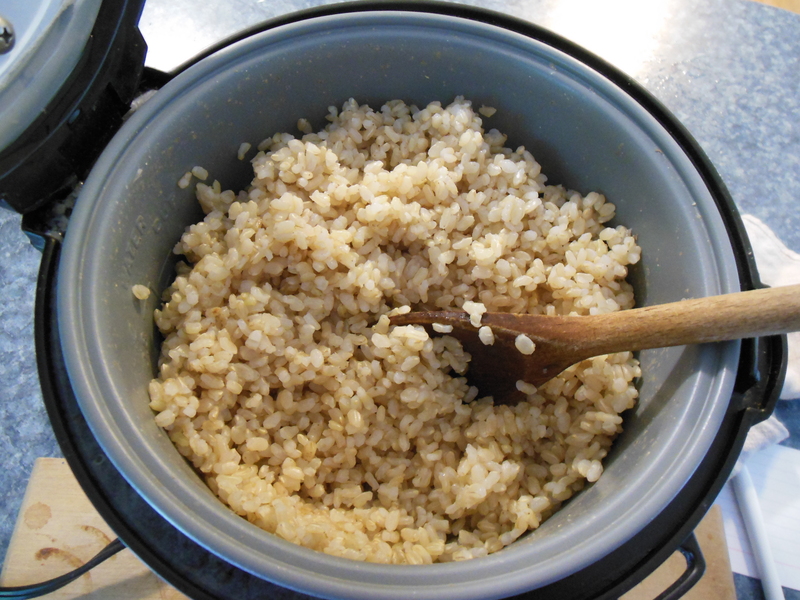 I went healthy all the way with no added oil and served over some organic short grain brown rice that I cooked in a rice cooker while I prepped and stir fried the rest of the goodies. It was absolutely delicious. The perfect light meal. Start by measuring your ingredients and preparing and cutting all the vegetables so that they are ready to go. For the Bok Choy, remove any bruised or withered outer leaves and trim 1/8 inch from the bottom of each. Then cut each head into quarters. 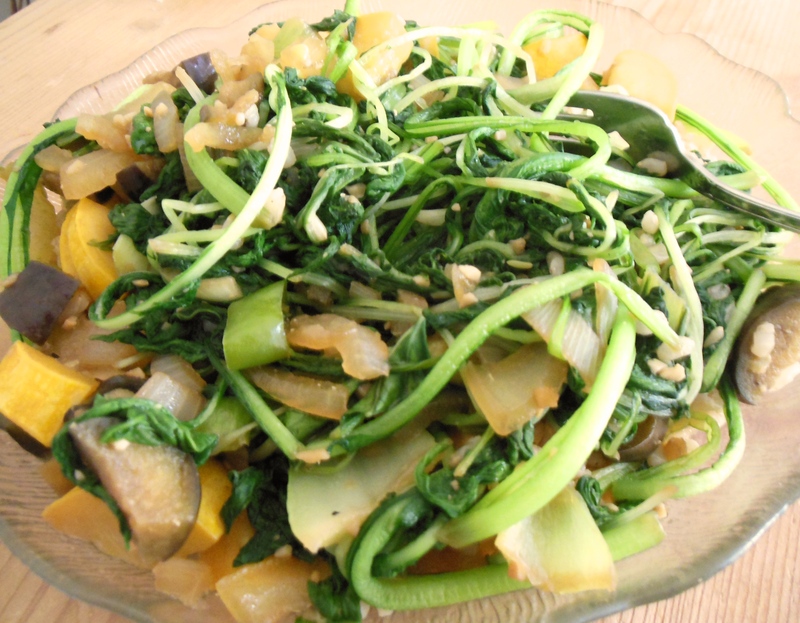 Wash Bok Choy in several changes of cold water and dry in a colander or salad spinner until dry to the touch. Once you are ready and begin stir-frying, it goes very quickly. Whisk together vegetable broth, rice wine, Tamari sauce, cornstarch, and salt, in a small bowl until cornstarch is dissolved. Set aside. Heat wok or large fry pan over medium-high heat. Pour about 2 – 3 tablespoons miso water into pan and saute the garlic and onions for 5 minutes. Add the mushrooms and continue to stir and saute 5 more minutes. 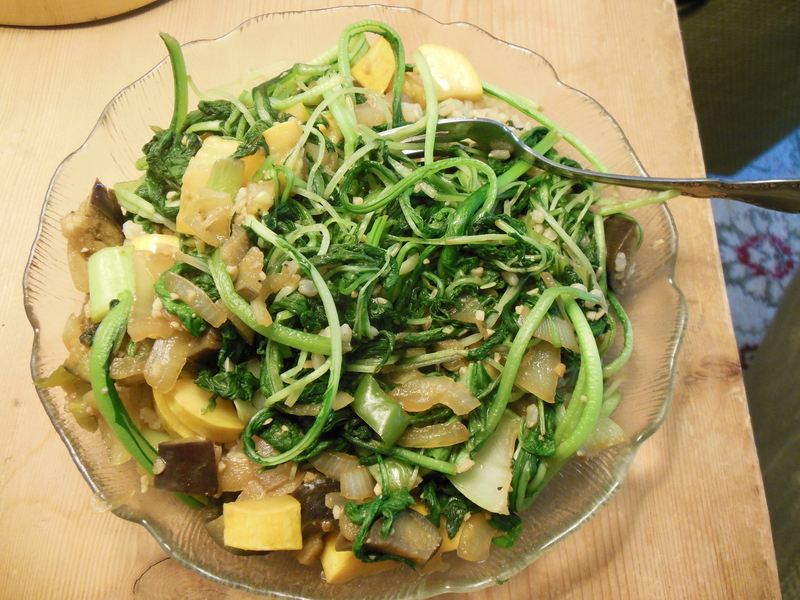 Add 2-4 more tablespoons miso water and then add the peppers and summer squash, stirring constantly. Cook 2 to 3 minutes. Next, add the Bok Choy and stir-fry until leaves are bright green and just limp, 1 to 2 minutes. Next, take the broth mixture and stir.Then pour into pan and stir-fry until vegetables are crisp-tender and sauce is slightly thickened, about 1 minute. 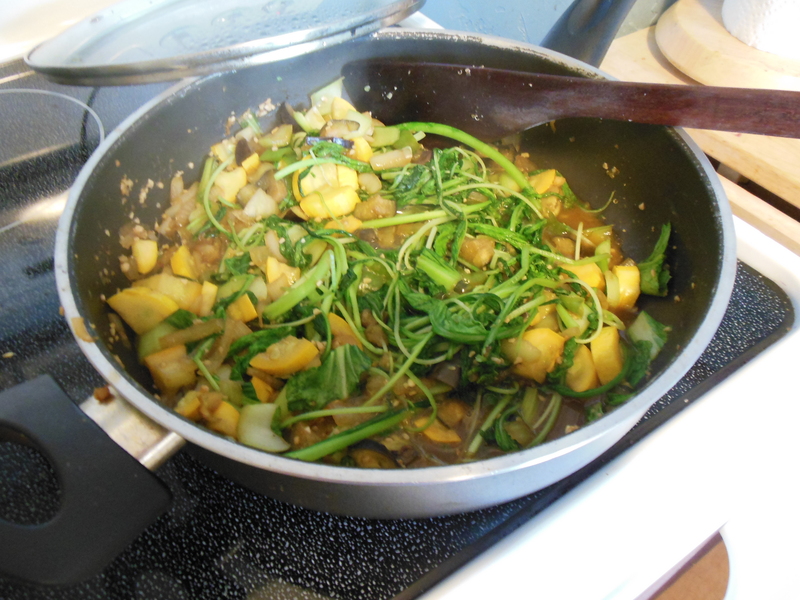 Last, add the Asian greens in handfuls until slightly cooked and lastly toss in the cashews just before you serve. Serve over brown rice for a meal, or without as a side-dish. I hope you give this recipe a try. If you can’t find the “fancy” greens I got a chance to use here, please use whatever greens you can find in your local market.